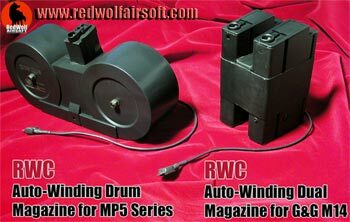 RWC Auto-Winding Drum Magazine for MP5 Series Rechargeable auto-winding 3000rd C-MAG magazine for the MP5 series is powered by rechargeable internal 4.8v battery. Providing a stable feed of BBs, the fully charged internal battery can drive well over 10000rd BBs. Fits all models of the MP5 series AEG from Tokyo Marui, ICS, Classic Army - A series, SD series, K and PDW.